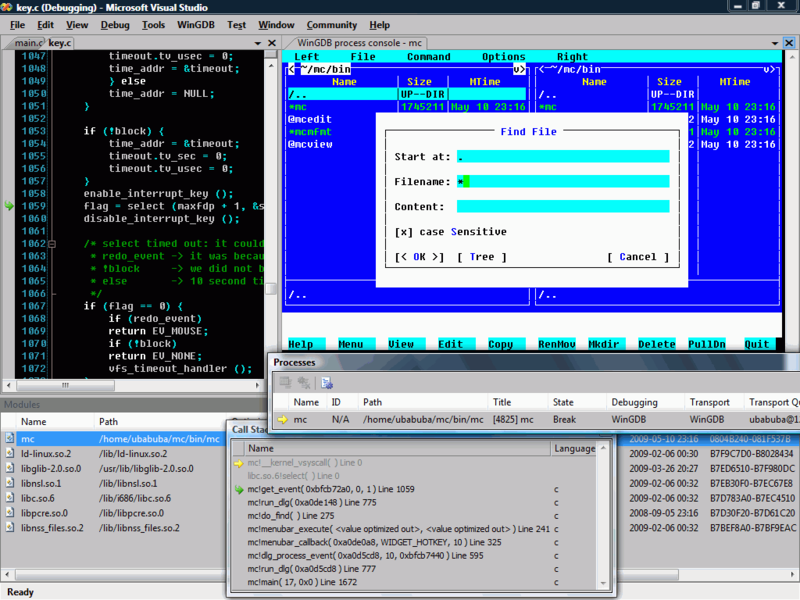 WinGDB is a Visual Studio Add-In allowing to debug embedded targets,Cygwin/MinGW applications or Unix programs on remote machines using GDB as a backend and SSH protocol for communication. Most Visual Studio debugger features are supported: launching or attaching to an existing process, source code view, stepping, breakpoints, call stack view, locals, autos, and watch views, multiple threads, I/O console with VT100 emulation, core dump analysis. The "Attach to process" dialog extension allowing attaching to remote processes with GDB. Remote edition of the source code in the Visual Studio editor. Edited file is automatically sent back to the target machine after saving it. Qweas is providing links to WinGDB 2.1 as a courtesy, and makes no representations regarding WinGDB or any other applications or any information related thereto. Any questions, complaints or claims regarding this application WinGDB 2.1 must be directed to the appropriate software vendor. You may click the publisher link of WinGDB on the top of this page to get more details about the vendor.